Let’s celebrate the Autumn ! If there is one season I really enjoy in Europe, beside summer of course, it certainly is autumn : a couple of sunny days here and there, autumn’s leaves colours, but also exciting times in my life, the birthday countdown has started, the wedding anniversary just passed(click here to see this year‘s dessert). Autumn also has a lot of apples, it is one of my favourite fruit, harvest mainly within the season. 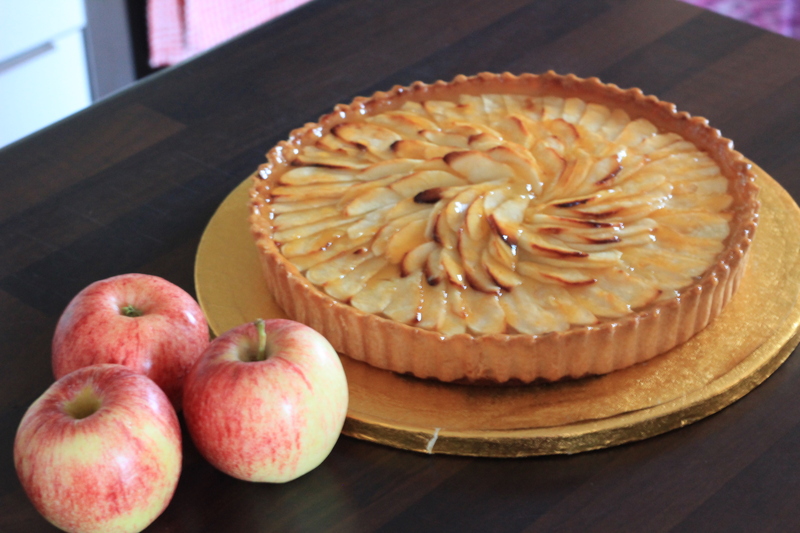 So why not start the autumn with a French apple tart. 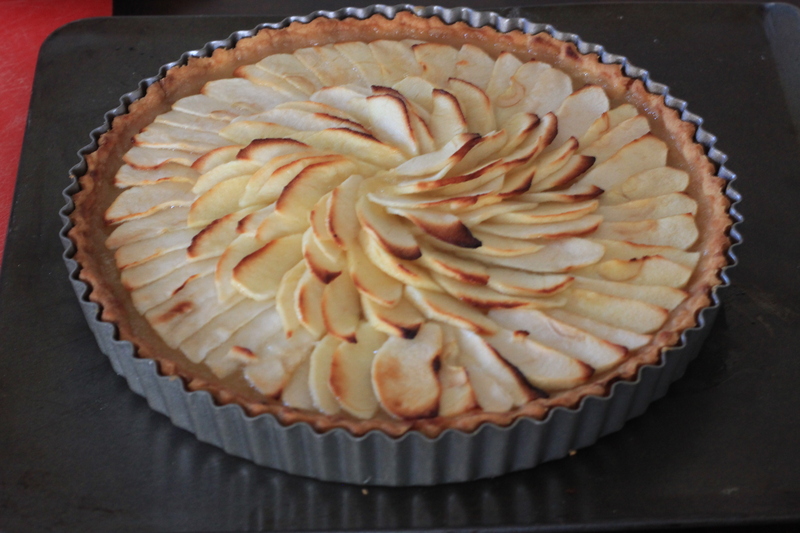 A rich shortcrust pastry, also known as « pâte brisée » in French, apple compote, and some nicely sliced apples. 1/Sift the flour and salt into a bowl. With your hand, rub the butter into the flour until it has the consistency of fine breadcrumbs. 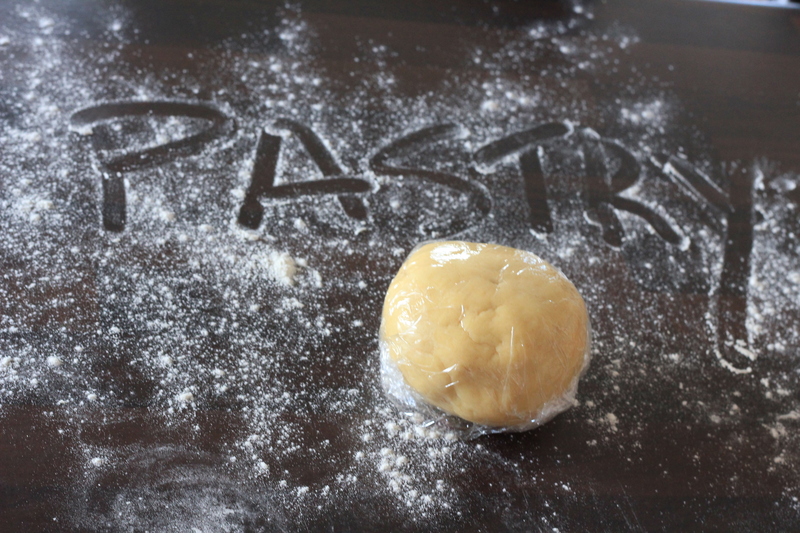 Stir in the sugar, and the egg yolk beaten with 2 tablespoons of water, then work to a dough. Wrap in a plastic film and chill for 30 minutes. 2/Preheat the oven to 200 degrees Celsius. 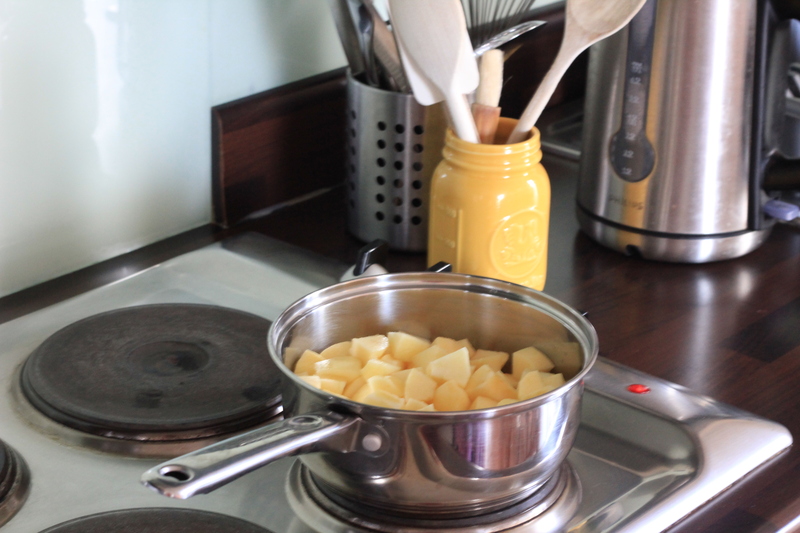 To prepare the filling, peel core and chop 6 of the apples, and place in a pan. Add half the lemon juice and 2 tablespoons of water. Cover and cook over a low heat for 20-30 minutes, until tender, stirring occasionally. Stir in half the sugar and the knob of butter, cook for 2-3 minutes, and then stirring to a pulp. 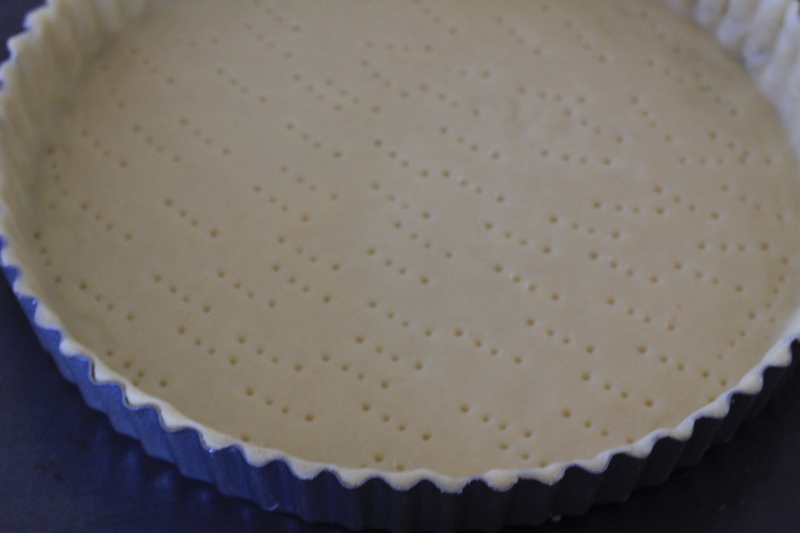 Prick the base all over with a fork, line the pastry case with greaseproof paper, fill with a layer of baking beans( or beans, or rice) and bake blind for 10 minutes. 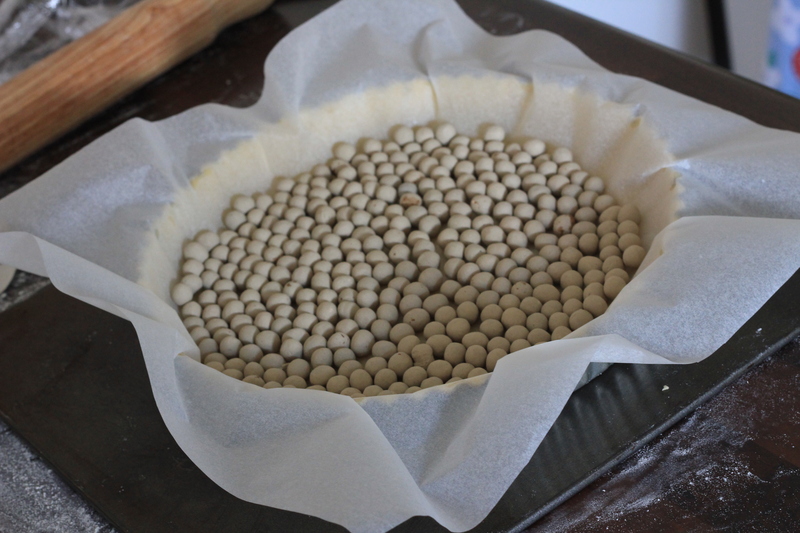 Remove the paper and baking beans and return to the oven for 5 minutes. 4/Reduce the oven setting to 180 degrees Celsius. Peel, quarter, core and thinly slice the last 3 apples, toss the slices in the remaining lemon juice and sugar. Spread the apple puree over the pastry and arrange the apples slices on top. Bake for 30-40 minutes until golden. 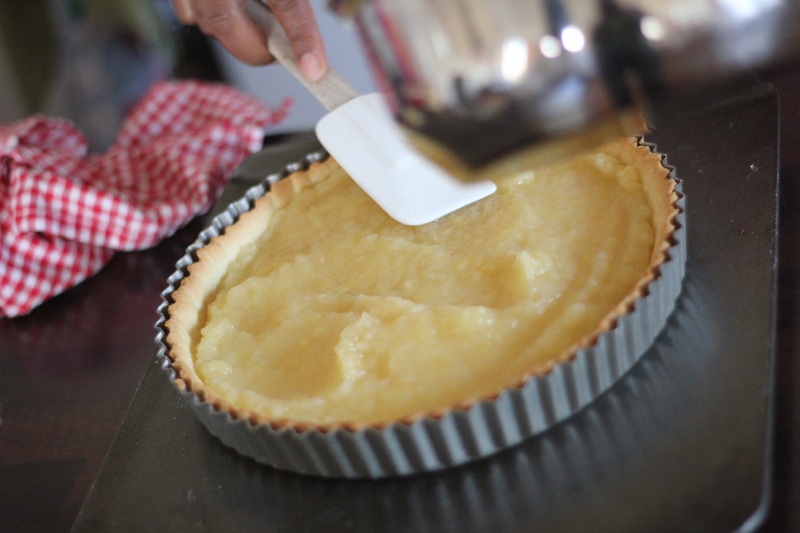 Leave the tart to cool slightly, and then carefully remove from the pan. Now to have this glossy result you see in the French patisserie, gently heat the apricot jam and 1 tablespoon of water in a pan, boil for 2 minutes until thickened, then push the jam through a sieve into a bowl and brush this glaze evenly over the tart. Serve warm or cold and really really enjoy. Hi,is any type of rice OK to to bake the dough ,what is your advices ? Hi, yes you can use any type of dry rice or dry beans if you don’t have baking beans, just fill with a layer. Thank you very much Do, go ahead.